It is available as an NPC option on all VendBots scattered throughout Delta V. You can't walk far without stumbling across one. Nearly every EpicDuel item you've purchased or upgraded in game with Varium is available in the Varium Buy Back Shop! If you paid Varium for an item and sold it back, it will appear in the shop. This also includes most promotional items that were included with Varium packages. Any item that a player has invested Varium into to upgrade stats will also be eligible. Cores, however, are not eligible. Does this include Home Items? No. 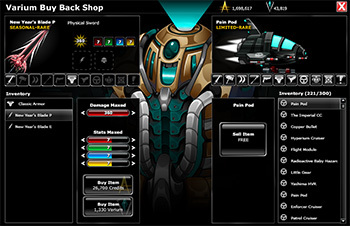 Home items have a separate shop and inventory interface from items a player can equip onto themselves so they do not use the Buy Back feature. Also, most Home Items can simply be purchased normally from the shop. These will appear in the Buy Back shop as well. Unfortunately, the Varium Buy Back Shop will only track one instance of an item. If you have 10 duplicates of a Varium sword and sell them all, the shop will only track one. Also, if you sell a Varium item, then purchase it from a normal shop, it will be removed from the Varium Buy Back Shop. The items will be added to the list instantly, however, you will need to close and reopen the shop if you are selling items while the Buy Back shop is still open. What about prize code items, NPC drops, Arcade prizes, HeroMart items, War Prizes, etc? While a lot of these items are indeed very cool, they do not have purchase records and therefore are not eligible for the Varium Buy Back Shop UNLESS you invest Varium to upgrade them. Even a small amount is enough keep them eligible for the shop. The Varium Buy Back Shop will show ALL of the Varium items you've EVER purchased or upgraded (excluding individual cores), all the way back to your account creation date. Never fear, we are NOT bringing back rare items! The only items people can get from the Buy Back Shop are ones they previously bought (then sold or deleted). There is one except detailed below. * You will also be able to repurchase seasonal items that appear in the shop even when they are out of season. *I see promotional items I don't remember buying! We use date ranges and Varium purchase quantitiy to determine whether or not you qualify for certain promotional items in the Buy Back Shop. Since some date ranges for promotions overlap, it is possible to qualify for multiple promotional items, including items you may have never purchased originally. Since tracking of the items in promotions before a certain date was limited, this was the only solution we had to allow players to have access to their old promotional items. The alternative was locking down nearly every promotion before 2013, which would have greatly diminished the usefulness of the system. Some items, like mission rewards, prize code items, HeroMart items, NPC drops, were not tracked as being "purchased" and since they were 0 cost items, were not tracked as being "sold". These types of items we can not provide for buy-back. There may also be old promotional items that were released prior to our modern receipt tracking that do not appear. We apologize for not being able to have everything available for buy-back. However, many items can be made eligible by investing Varium in them to upgrade. Credit-only items are not tracked. Will I get an achievement? Yes! Because some items have low credit buyback prices, only Varium Buy Backs will be eligible. HELP! My little brother got into my account, and sold all my items! Can the Artix Help Team give them back? The Artix Help Team will not return any items that have been sold. The only way to get your items back is through the Varium Buy Back Shop. Please do not share you account and keep it safe!